For useful promotional products with a extraordinary user value, choose the folding umbrella from allbranded. Rain is everywhere and soon so will be your customers! Make new customers and old business partners happy with a very functional thank you. Decorate these promotional umbrellas made from pongee and polyester, with your company logo or a beautiful slogan and trigger a change. With these awesome giveaways from allbranded you will definitely increase the positive advertising effect on your company. There are many reasons, which speak for buying branded umbrellas as promotional products in our online shop. Next to the high quality craftsmanship and the large range of selection, the other aspect of which speaks for its promotional vallue with your decorative logo print. Convenience is a priority and we know it! Much like our phones have become more compact, there are portable versions of most regular products today. Why? Because we move about a whole lot and are automatically drawn to those that represent ease of use and storage. Why else would we find the mini shampoo bottles and conditioners in hotels so attractive? The personalised umbrella is not simply aesthetically pleasing but has practical purposes and such small alterations make for an easier monday morning commute. Our small printed umbrellas are live savers, the less we have to think about them the better. Not worrying about where to place them at work, on the bus or train is now considered the norm but it is also a luxury which you can make use of for a very small price indeed. If you are however looking for a larger variety for different purposes, do check out our printed golf umbrellas for greater visibility effect. In the year 1928, Hans Haupt revolutionised the umbrella by producing special mechanics to the existing prototype. The so called folding umbrellas, which are connected to the brand ‘Knirps’ are compact, practical and foldable due to their telescopic tubes and pongee & polyester material. These umbrellas are easily storable in handbags, office bags and printed backpacks. Also small and portable is our range of pens, mugs, keyrings and bags for your consideration! Because of the unique functionality this product offers, they are now considered perfectly suitable for outdoor activities such as for shopping sprees, an open-air concert or a walk in the park. How about custom automatic umbrellas, which can be opened and closed by just the press of a button? The elegant traveller umbrella is an exclusive in terms of design lightweight fibreglass ribs. 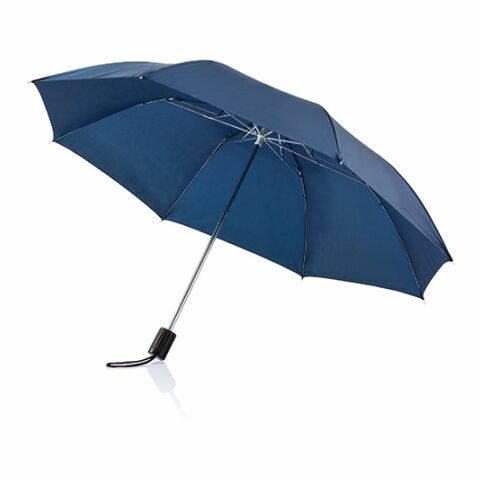 For special occasions we would advise you to consider the Samsonite Rain Pro Umbrella. The allbranded umbrellas are available in a wide range of colours to suit your taste and requirements. Studies show, that a promotional product is especially effective if it is practical. This form of umbrella is one of the best when it comes to efficiency and are especially so when it comes to spreading a marketing message. On their large canopy, you can print a logo or a marketing claim, which can be positioned perfectly for maximum attention, and will be very visible on rainy days. Subtle but also very eye-catching, this logo can also be put onto the umbrella sleeve or onto the umbrella closing band. If you are looking for greater visibility why not browse through our golf umbrella collection? We also recommend our selection of pens, mugs, keyrings and bags for excellent printing. Using printed umbrellas as customer or employee gifts is also a good idea, as they often change hands regularly. This way so will your message and will grow your entire circle of potential clients. Give away folding umbrellas, for example as giveaways at trade shows, or at recruiting events, or you can even use them as brand ambassadors within internal communications. Why not leave a lasting impression by giving the promotional umbrellas away as part of an outdoor promotional package, consisting of an umbrella, a T-shirt and a hat?